Cloud computing is a term which many people have heard of but don’t necessarily know what it is and how it could work for their business. In basic terms cloud computing refers to using the internet for all your computing needs and a ‘cloud’ is a metaphor for describing the internet. Where can cloud computing be accessed from? As cloud computing is an online operating system this means that it can be accessed from any computer via the web. ‘Clouds’ are usually used as a single point of access for all computing needs which makes cloud computing the ideal choice for people who travel for their work or for companies with a large sales force. The service can also be accessed from any device with web access such as mobile phones. 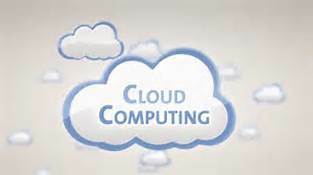 This really depends on each individual company as cloud computing can be used in many ways. Customers can use existing applications which have been developed by the service providers or customers can create their own applications which their company can use to streamline their services (or even use just for fun like games). What’s the difference between cloud computing and regular hosting? There are three main differences between cloud computing and more traditional hosting. With cloud computing customers only pay for the time that they use the service for which could be anything from a few minutes to many hours. Cloud computing is scalable so customers can choose how much of the cloud service they wish to use. Finally, customers have nothing to do with managing the service so they can take advantage of all the benefits of cloud computing without worrying about how it works. There are plenty of benefits of using this service, firstly the service is easy to implement as there’s no hardware or software to install, no licenses needed or purchases to be made and customers can be up and running in no time at all. Cloud computing is scalable so a company only has to pay for what it consumes which makes it suitable for businesses of all sizes with a range of budgets. As the service is provided by a third party, companies can also save money and space on servers and storage. The flexibility of the service means that as businesses grow and develop they can add applications to their cloud computing which can make running their business easier. The main benefit of cloud computing is that it allows businesses to store all the information they need in the one place so team members can access the information they need wherever they are, as long as they have web access. Cloud computing can enhance the processes of most businesses by making company data more organised and easier to access as well as enhancing a company’s infrastructure. Source: GoArticles by Author David Eaves from Lancaster, UK. If you are looking for a CRM software solution David recommends you go to Salesforce.com UK, the enterprise cloud computing company.